US immigration judges will be expected to complete 700 cases a year in a new quota system, prompting fears that cases will be rushed through. 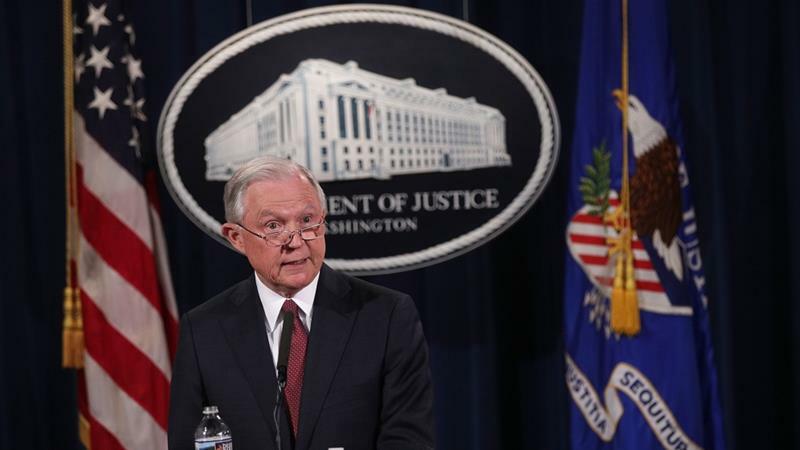 The Department of Justice's Executive Office for Immigration Review announced the measure in a memo on Friday, which was first reported on Monday in the Wall Street Journal. The numerical targets for the roughly 350 immigration judges working for the department are intended to reduce a backlog of around 680,000 cases. "Using metrics to evaluate performance is neither novel nor unique to [the Executive Office for Immigration Review]," James McHenry, the office's director, wrote in the email which outlined the new measures. "The purpose of implementing these metrics is to encourage efficient and effective case management while preserving immigration judge discretion and due process." On Monday, the Department of Justice said judges currently complete an average of 678 cases a year. The new standards are set to take effect on October 1, but could still be challenged in court, said Al Jazeera's Alan Fisher. "It could be open to challenge in the courts particularly from people who would be concerned that judges are more interested in processing the number of cases rather than due process in their courtrooms," he said. The National Association of Immigration Judges opposed the quota and called it "completely, utterly contrary to judicial independence". "We believe assessing quality is fine, not quantity," Dana Leigh Marks, a union spokeswoman, told the Associated Press. The move had been alluded to in October, when the Trump administration said it wanted to introduce "numeric performance standards" on immigration judges in a wish list of immigration policies. Deportation arrests in the US soared by nearly 40 percent in the 100 days after Trump took office compared with the same period a year earlier, adding to the backlog. Trump was slammed on Sunday and Monday for incorrectly linking a "caravan" of Central Americans making an annual pilgrimage to the US border with a programme that protects hundreds of thousands of undocumented people who were brought to the US as children. The president lashed out at Mexico on Twitter for allowing a "caravan" of more than a thousand Central American migrants pass through the country. The so-called "Easter Caravan" is organised by activists who aim to highlight the plight of people escaping crime and poverty and seeking sanctuary in Mexico or the US. "Mexico is doing very little, if not NOTHING, at stopping people from flowing into Mexico through their Southern Border, and then into the US. They laugh at our dumb immigration laws," Trump said in a Tweet posted on Sunday. "'Caravans' coming. Republicans must go to Nuclear Option to pass tough laws NOW. NO MORE DACA DEAL!" another Tweet read, referring to the Deferred Action for Childhood Arrivals programme (DACA), which protects about 800,000 undocumented immigrants brought to the US as children. The US president threatened to pull out of the North American Free Trade Agreement (NAFTA) if Mexico did not tighten their immigration policy. Mexico's Secretary of Foreign Affairs Luis Videgaray Caso responded on Twitter, saying "Every day Mexico and the US work together on migration throughout the region. Facts clearly reflect this. "An inaccurate news report should not serve to question this strong cooperation. Upholding human dignity and rights is not at odds with the rule of law. Happy Easter." Mexico in 2014 launched its Southern Border Plan with financial aid from the US government and detained about 300,000 migrants in the two years after. The Easter Caravan has been organised annually over the past five years by activists of Pueblo Sin Fronteras (People Without Borders). By moving in a large group, the organisation hopes to protect participants from countries including Guatemala, El Salvador and Honduras from cartels, which often extort migrants. This year's Easter Caravan set off from Mexico's state of Chiapas on March 25.